1. In which religion a number of Gods called ‘Kami’ are worshipped? 3. Abraham is the founder of Judaism as well as the ancient Kingdom of Israel. What does ‘Abraham’ mean? Answer: Father of many nations. 5. At which place Gautama Buddha got enlightenment? Answer: Near Gaya – Bihar. 7. In which religious calendar we find the months of ‘Shevat’ and ‘Tammuz’? 8. Of which country is Confucianism a native religion? 9. In Christianity who betrayed Jesus Christ to the Jewish high priests for thirty pieces of silver? 10. 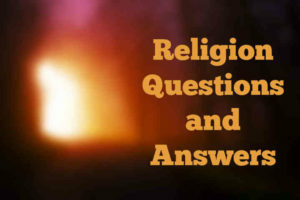 Hinayana and Mahayana are the two main sects of which religion? 11. What is the name of the religious belief that acknowledges only one true God? 15. In which country the Christians are called ‘Copts’? 16. The word apostle is derived from which Greek word? 17. What is the meaning of the Greek word ‘Apostolos’? 18. In which country the ‘War of Religions’ were fought? 19. Under which tree did Buddha attain enlightenment? 20. What is the meaning of the word ‘Shinto’, the Japanese religion? Answer: The way of the spirits.